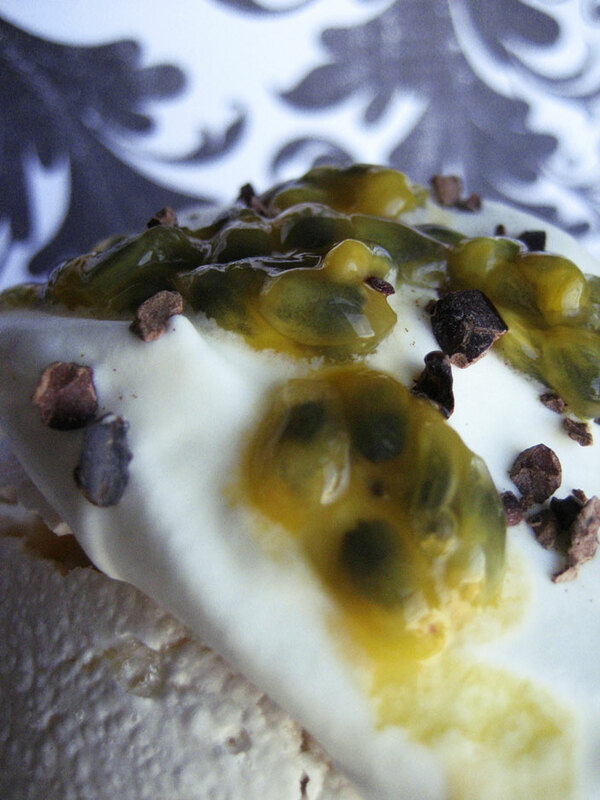 When I read “passion” I immediately though of passion fruit, and Z’s favorite dessert, passion fruit Pavlova. It was a pretty perfect match. But how to translate it into a cupcake? Bakes up remarkably cake-ish looking. I first considered doing some kind of angel food thing, since that’s fairly meringue-y. 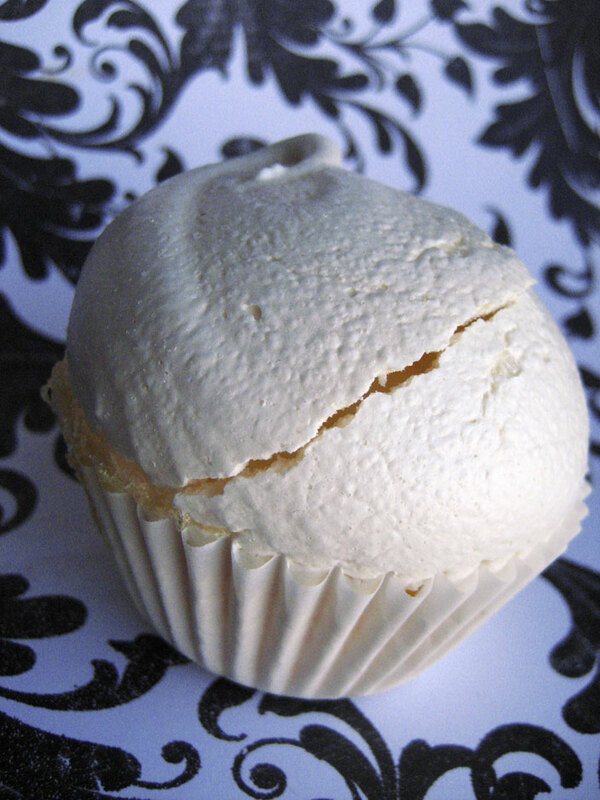 But then I thought about it…why not just bake meringues as cupcakes? Could it be done? Had it been done? Soft & pillowy interior...my favorite part. Turns out it could and had, by none other than The Martha. Hoping she wouldn’t let me down, I went ahead and made my own batch. I apparently didn’t read the instructions (that I even hand-copied) thoroughly enough to realize that I needed to spray the inside of the liners if I wanted to pull them off the cupcakes, but Z said he liked that he had to dig into the paper to get at the deliciousness inside. The cupcakes, by the way, came out great. Their one “flaw” was that they all cracked along the top…which turned out to actually be just right since I could just pop off the tops and fill them. Curd is wonderful. I love curd. I don’t normally use curd in my Pavlovas, mainly because I prefer the intense contrast between sweet meringue, tart passion fruit and rich whipped cream, but these are cupcakes! And cupcakes like to be filled with rich, yummy curd. I know. They told me. To get an especially passion fruit-y looking curd, I mixed cacao nibs in before letting it set up, giving the appearance of seeds in passion fruit pulp. This softens the nibs considerably but since I was adding more on top for crunch I figured it didn’t really matter. If you want to preserve the crunchiness add the nibs right before serving. Replace the hat, add the whipped cream, fresh fruit & some nibs. Enjoy. Combine all ingredients but nibs in a medium bowl over a pot of simmering water. 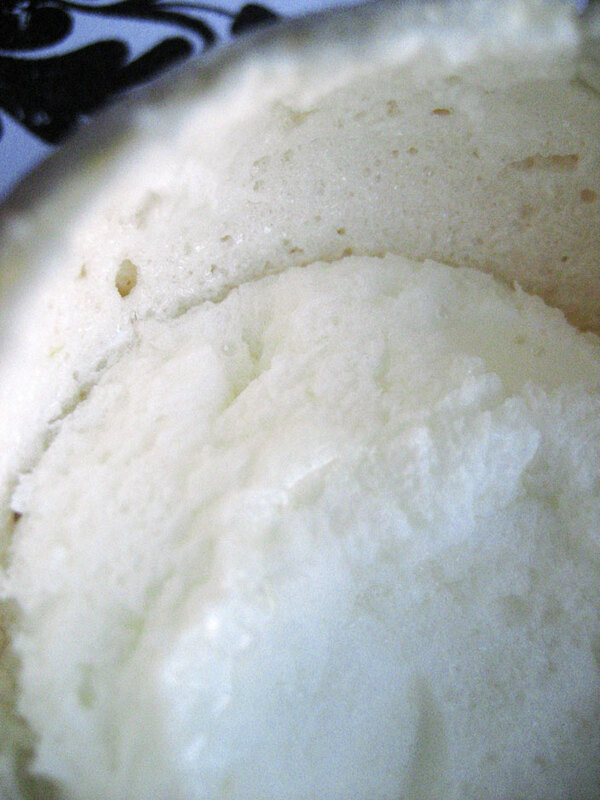 Whisk constantly until the mixture thickens and becomes custardy in appearance. Strain into a bowl, stir in nibs and chill with plastic wrap pressed onto the surface of the curd. Preheat the oven to 225. Line every other cup of a 12-cup regular sized muffin with paper cupcake liners. Spray the interiors of the liners (optional). In a stand mixer fitted with the whisk attachment or with a hand mixer, whip the egg whites with the salt and vinegar until foamy, then gradually add the sugar. Whip to stiff, glossy peaks, then transfer to a piping bag with either no tip or a very large round one (I just used a plastic bag with a corner cut off since appearances at this stage don’t matter) and pipe the meringue into the liners. Bake for about 3 hours, rotating the pan once. 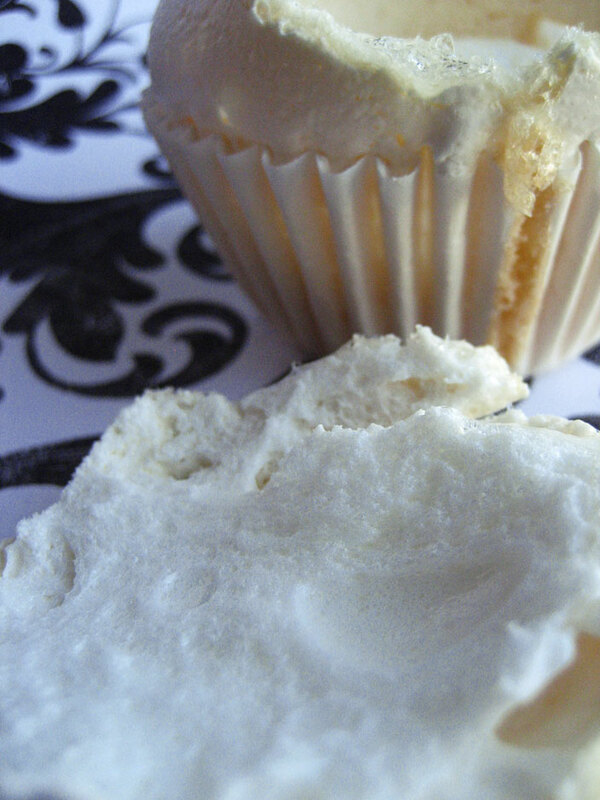 The cupcakes will puff up much like real cupcakes and eventually crack along the top – this is good. Once a skewer/toothpick inserted down the side of a liner comes out with moist but cooked crumbs, remove from oven, peel liners off (if they were sprayed) and cool completely on a rack. Makes six. Pour the cream into a well-chilled mixing bowl. Add the vanilla sugar and use a balloon whisk to whip to medium peaks; set aside. Pull the cracked top(s) off of each cupcake you are serving and fill with 2-3 Tbsp of curd per cupcake. Replace the top and add a dollop of whipped cream, then carefully spoon on the passion fruit and sprinkle with the cacao nibs. Serve immediately (on a plate). After teasing me with your earlier tweets, this does not disappoint. 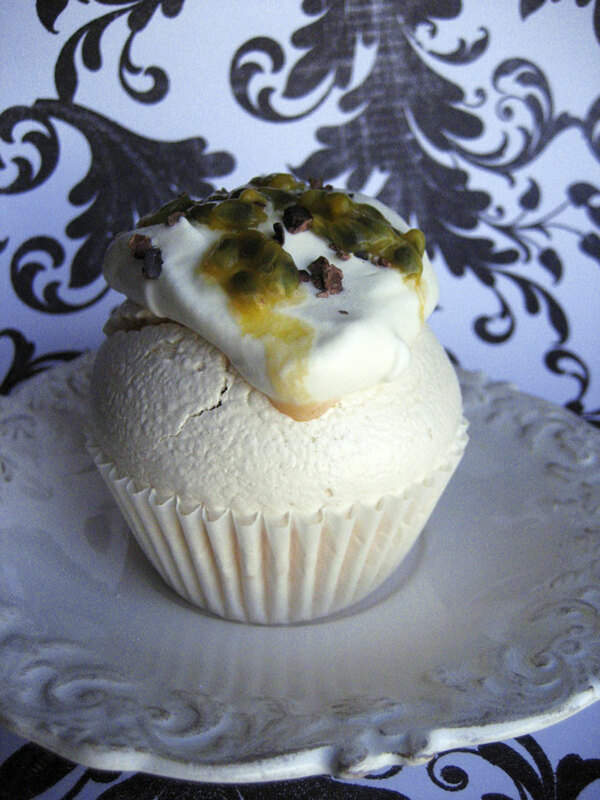 A pavlova cupcake – that is just beyond all things… yum! What a gorgeous idea for Pavlovas! I haven’t even seen that in AU or NZ where they are meant to originate from! I will keep this idea for future and I just love mine with passionfruit curd. 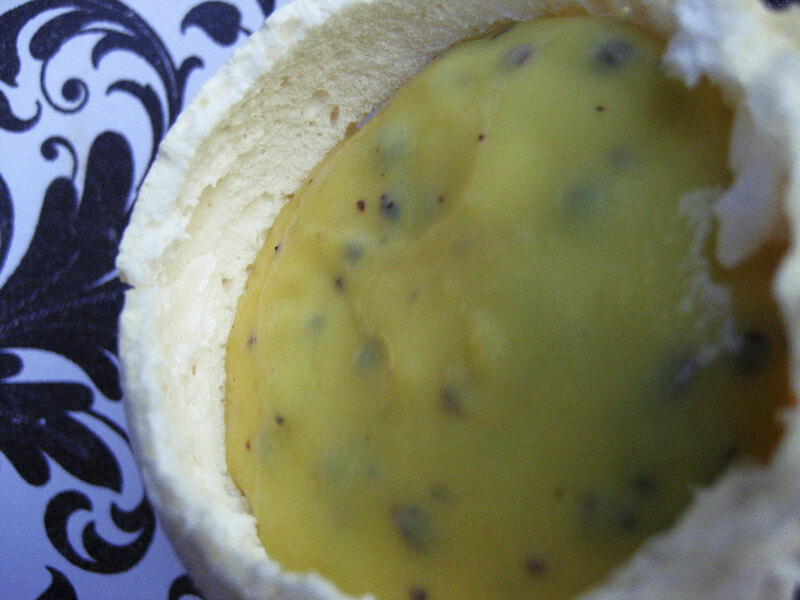 Absolutely perfect idea – I have frozen passion fruit puree in my freezer and I would love to make something like this. Mmmm.